Ready to escape the city for a quick get-away? If you live ITP (Inside the perimeter) you are so close to some of Georgia’s greatest hidden treasures. 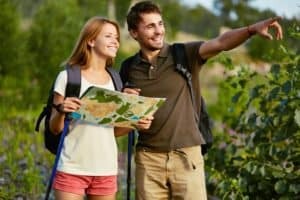 Why travel far when you can hop on 85 North and be at a bed and breakfast on lake lanier, wine tasting or hiking in the great Georgia Mountains? Only an hour away. If you are itching to get out into nature and not sure where to go, here are some great options. Did you know you can rent your own boat, jet ski etc? Click here for a great company I recommend. You can check out different restaurants along the lake and even stop by the Lake Lanier Water Park for the kids. My all time favorite restaurant is Fish Tails. They have a great patio overlooking the marina and live bands. There are so many options to explore here. I will name two of my favorite. Fort Yargo State Park is located in my hometown, Winder, Georgia. The park offers a 260 acre lake, over 20 miles of hiking, running and biking trails, disc golf, tennis courts, basketball courts and playgrounds. This is a great day trip or overnight camping trip. If you want to go even further north, check out Tallulah Gorge State Park. The gorge has six cascading falls that you can hike to. On a rainy day, you can go gold panning, gemstone mining and take a tour of a mine. Great activity for the kids. They will have a great time finding treasures and learning. Check out Consolidated Gold Mine in Dahlonega, GA. If you need a vacation and need to unwind, here are some relaxing and rejuvenating places to visit. There are numerous options for Bed and Breakfast. A great website to use is BedandBreakfast.com. If you want to combine bed and breakfast near a winery, check out Wolf Mountain Vineyards and find a place in Dahlonega. Lake Lanier Islands also offers a variety of accommodations. They have a lodge, private villas, lake houses, and campgrounds. When looking for fun and unique places to stay, I personally use Airbnb.com. If you are looking for comfort food, you have to check out the Dillard House. If you are looking for a family style lunch/dinner with generous portions of southern food, this is a must. This is an easy day trip. It is located very close to other wineries. They also offer accommodations. As you can see, Georgia has several options so close to home. Please let me know if you ever have any questions at all or would like more recommendations for getaways in Northeast Georgia. Residing in the Northeast part of Atlanta, I can point you in the right direction. Give us a call at 404-419-3619!